Ever since I could gather up a writhing handful of worms, I’ve been drawing. I’ve always been fascinated by the structure and lifestyles of animals. Through this deep admiration, I sought to honor these mysteries by creating artwork which captured their familiar and often ethereal essence. As a child, my favorite things to watch on TV were the nature documentaries aired on the Discovery Channel. A frequently occurring and ever inspiring scene was footage of predators going after various prey animals. With every muscular, surging bound from both predator and prey, I was pulled into their world. It was difficult for me not to get lost in it! Some people watch sports and find themselves completely absorbed in that. For me, it was the drama of the animals. 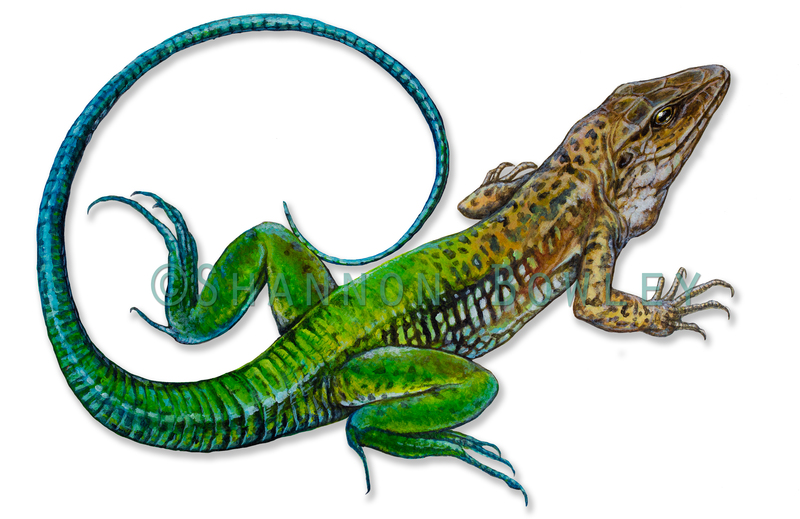 My latest acrylic painting, a species of reptile I’d seen recently in Panama. I’d tried to capture the highly aware adult males on a few occasions, but they always bolted off just as I hinted interest in them. 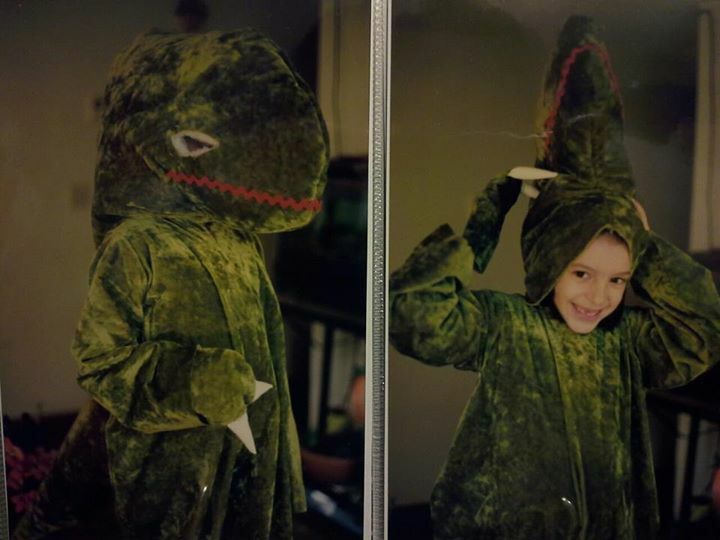 Tyrannosaurus rex inspired halloween costume back in the 90’s. I couldn’t see out of it until we made ‘nostrils’. Hah! I kept watching the documentaries, made the most of frequent trips to the library and sought out books on animals of all kinds. When I had access to them, I absorbed imagery and information like a sponge with magazines like National Geographic. Those articles made a tremendous impact on me that persists to this very day. When it came to watching the animal documentaries, I was deeply impressed at the sight of these tremendous releases of animal energy, particularly as a chase began – kicked up clouds of dry savanna dust, determined swimming in deep, surging rivers, or an explosion of snow flurries after adroitly placed footfalls over steep and rocky cliffsides. These animals were fantastic athletes and strategists combined. The psychological and emotional draw was the laser-like focus in their eyes; a searching out in either animal inspired by the most primitive of fears or hopes – this very real struggle to live for just another moment. In order to survive this swinging pendulum of an existence, both animals had bodies built in ways that made complete sense for their lifestyles. I thought about coat colors and patterning, the thickness of a fang or the curve of a claw. Observing the functions of such structures planted the seeds for an artistic interest in anatomy, comparative anatomy and aspects of physiology. To capture the essence of these animals accurately, you have to love the biological machinery that powers and drives it. Analyzing these patterns, I often contemplated humanities accomplishments and ideas – our tools – machines and technology. I realized at a very young age how humankind was mostly mimicking what Nature had already worked for so long to perfect. (and still works at to this day) All of these interests combined ensured a deep love for science in general, spanning an expanse of various fields. Aside from hunting scenes, I loved the way in which so many animals simply moved; a relaxed and springing lope that reminded me of the jiggle of a rubber band, the uneasy twist of the ear, or an aggressively curled lip paired with a furrowed brow – I strongly related to all of these expressions because you could see it in people, too. Growing up in a house full of animals of all kinds, another way I experienced animal behavior was through our menagerie of captives ones. I was always keenly interested to see animals behaving as they chose to – as individuals in the cage-less expanses of the wild, but that was rare. I grew up in quite developed areas, so I just didn’t have many opportunities for such experiences unless our family was on vacations in St. Anthony, Idaho, or until I was much older. Mammals inspired me most throughout my life. I focused on canines, the big cats, horses and the like. Really common subjects. But you could never really ever study them enough, draw them enough – there were always so many nuanced ways in which to illustrate them. As my interest in various sciences and technologies increased, I blended my love for animals with it. I was no longer drawing for the sake of realism, or to capture animals naturally in real habitats. I found myself focused on the fantastical from around 2002 until about 2010, feeling increasingly conflicted about my artwork as the years went by. Something seemed off, and my enthusiasm for it all began to fade away. That kind of artwork was more of an escape from a very challenging portion of my life, a buoy of many sorts. I wasn’t in any particular world, but eventually I found myself firmly planted in reality again. It was a relief to find myself embracing the full weight of it, and with great passion. Spiders sorted me out in so many ways – around 2009 I conditioned myself to lose my fear of them. This opened my eyes to an entirely new world where I understood next to nothing. The realm of arthropods was all around me, and yet I’d never really explored it. 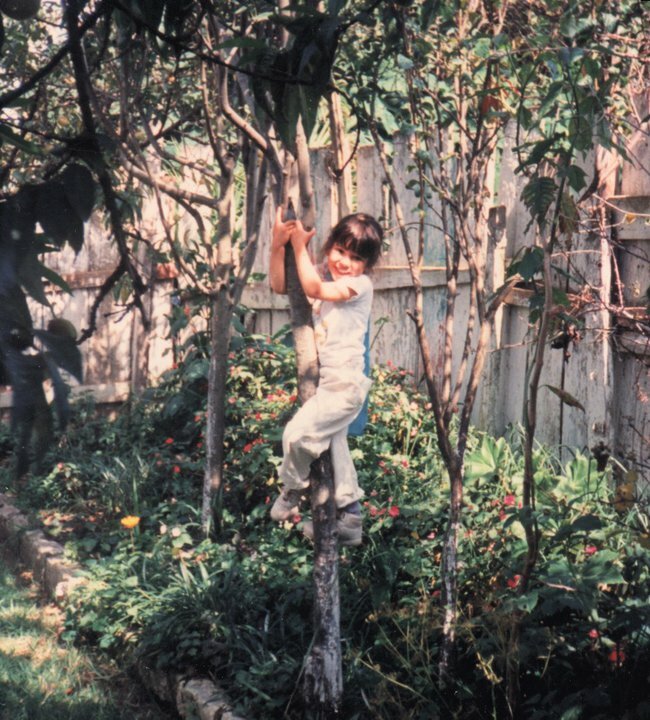 While this didn’t revolutionize my artwork right away, it smashed open the long closed doors to what I had always been most inspired by – the natural world. I found myself outside again! Long story short, I’m infinitely excited about where I am right now – in small ways that feel big, I’m right where I want to be. I’ve a lot of catching up to do, but I’m not intimidated anymore. I’ve been painting new subjects and am SO excited to illustrate the lives of the creatures near and far to me, with subjects ranging from the smallest invertebrate, to the largest of our planets prehistoric leviathans. I’ve a renewed fascination for reptiles and amphibians, birds and so on. 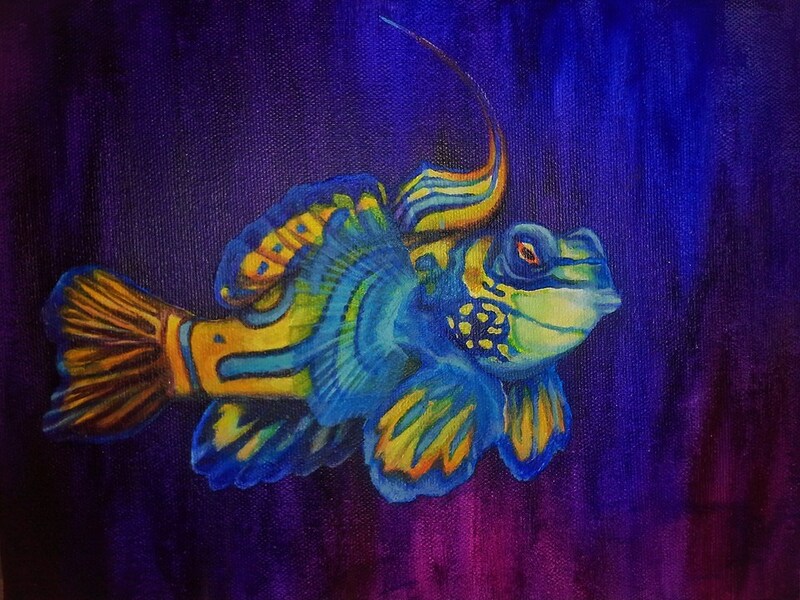 Regarding materials, I hadn’t used acrylic paints since around 2006, even though it was my very favorite way of painting (as far as I’d experienced, anyhow) and I’ve recently been gifted both the paints and an easel to work on. I’m seriously in heaven! It also helps that I’ve been surrounding myself with very inspiring artists (at least through the internet) and many of them have been incredibly supportive and helpful to me as I teeter around trying to get things reignited again. James through the years, especially. He kept reminding me that I should be doing this type of work, and I frequently dismissed it as something that seemed impossible. I suppose things can seem impossible when you haven’t even tried to for a good while! I’m glad I finally listened to him – he knew where my heart was. My great desire, aside from advancing my knowledge of various organisms, photography and artwork in general – is to merge my love for animals, science and art with my love for sculpting. My plan is to create ceramic items in the future. 🙂 I have SO many ideas for these items that my head feels like it will burst from the enthusiasm of such acts of creation. I feel this way about my paintings in particular, but I’m currently in the process of creating them, which is a relief! Anyhow, there is a lot I’ve got to do so I can get to that point. I’ll have to take some classes and arrange for a work space, but now I know it is possible. I’ll have to figure out a way to do it between being out in the field with the camera gear, but if there is a will, there is most definitely a way. 😀 Heck, I never thought I’d be where I am now! And honestly, even though the path along this journey will be a very difficult one, I’ve never been happier to take those first awkward steps into it.